Particulars:Recently extensively upgraded, complete engine overhaul (EU specs), new paint etc. Audi designed a prototype four-wheel drive based on the Audi 80, with a 100% mechanical all-wheel drive system with center differential from the DKW Munga. 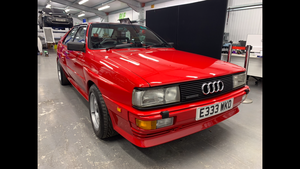 They knew it was good when on a snowy mountain road in Austria, where at that time a manufacturer of snow chains was testing his products, a Audi 80 with only winter tires fitted extremely quicker was than a car with snow chains. 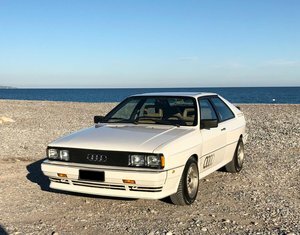 In March 1980, the Audi Quattro Coupé, a sports coupe with turbo engine and four-wheel drive was presented at the Geneva Motor Show, being a true sensation. 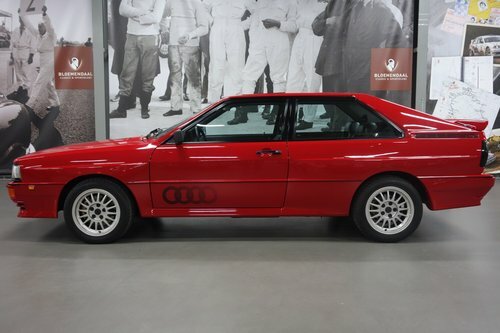 Audi at that time actively participated in the rally sport: the best public relations for their all-wheel drive cars mainly because of the better traction. 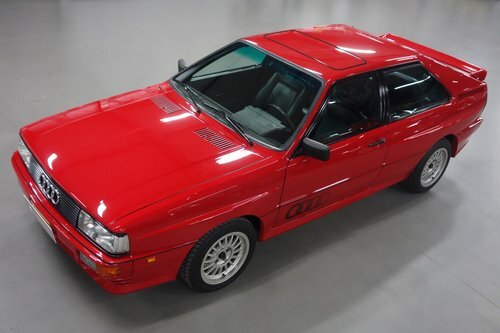 Participation in the toughest rallies and the large number of wins showed also the reliability of the Audi Quattro. 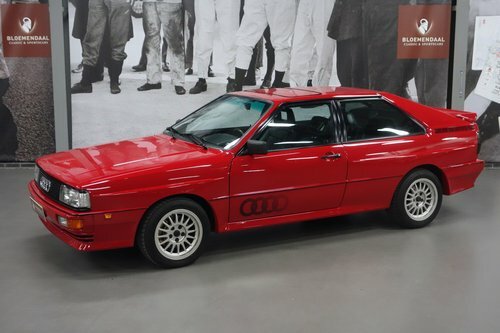 The first Audi Quattro, by connoisseurs and enthusiasts called “Urquattro” were only 11,452 cars built. “Ur” is added to the name because of the fact that this car has been the concept of a four-wheel drive passenger car which was successfully put in a new market. 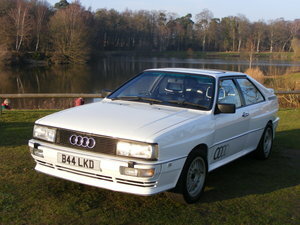 The four-wheel drive system was also used for other Audi models and developed to a perfect working piece of technology. 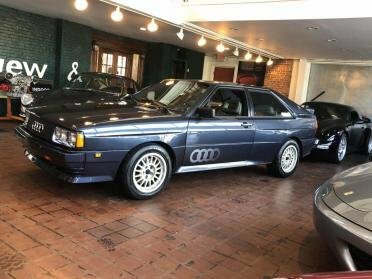 The all-wheel drive Audi’s have still the word “Quattro” in the model designation, though the technology behind it is no longer the same. 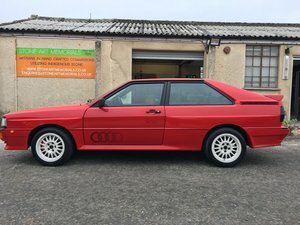 These days, the lovers of the Urquattro know a really good car is not cheap…. if it is available. 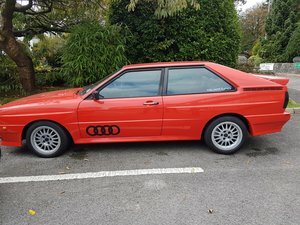 This Audi Quattro was originally delivered to the USA and came in 2012 to the Netherlands. Here, on a collector’s behalf, the beautiful Coupe was thoroughly made to perfection. 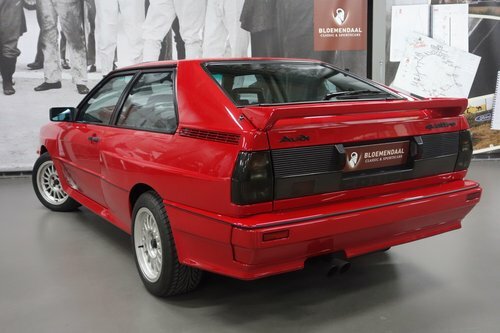 The bodywork, unlike many quattro’s in Europe, was very straight and no signs of rust. However, the paint was completely renewed by a true professional. 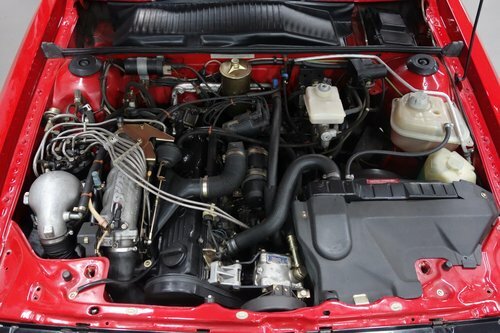 Also the engine was completely overhauled and converted to EU specifications, which also boosted the horsepower and torque. 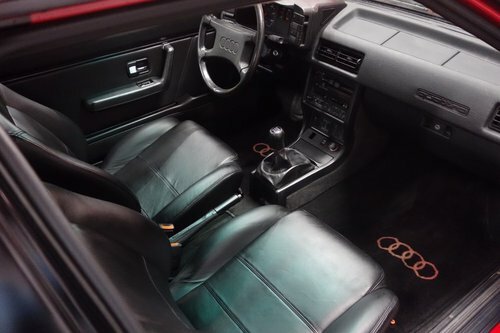 The front seats were also fitted with new leather upholstery, and many other smaller work was carried out, making this Audi in perfect condition. 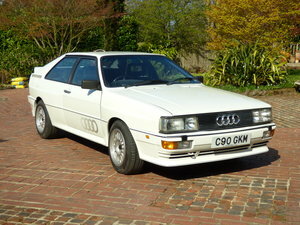 This UrQuattro is a great fun to drive, a true daily usuable driver, and is a good investment. Power:200 bhp. at 5500 rpm.